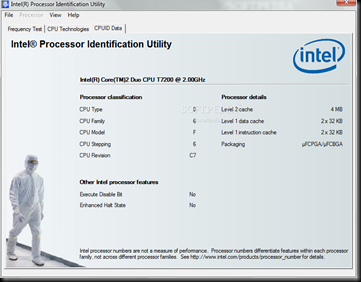 The Intel Processor Identification Utility is an official utility by Intel Corporation to identify the processor inside a system, assuring the processor contains intended technologies and is operating at the tested and rated frequency as intended. This utility gives perfect information about your CPU like: Speed, System Bus, L2 Cache memory. It also tells whether your processor supports Advanced Technologies like: Virtualization technology, Hyper-Threading Technology and Intel 64 Architecture. The utility is a standalone program with no installer. Simply download the file and run it. It is consistently updated to support the latest Intel processors. There are two versions of this utility: The “Windows” version and “Bootable” version.